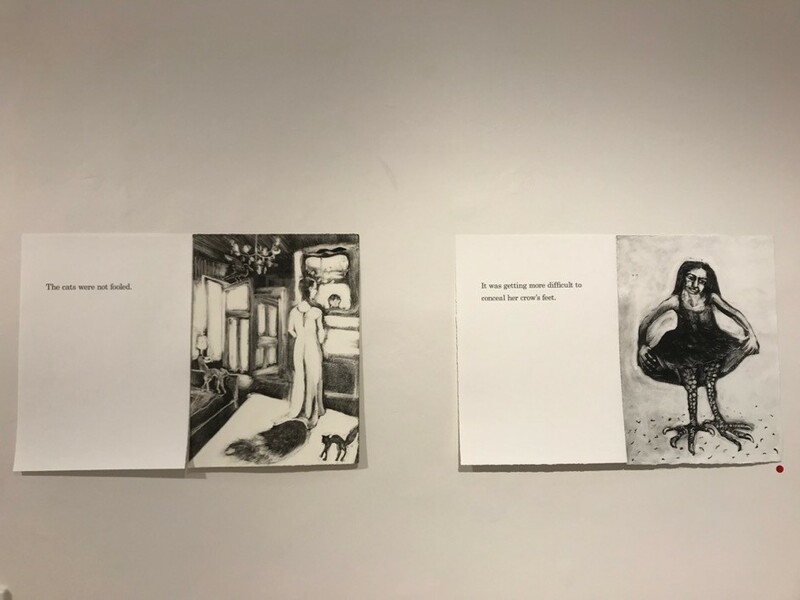 Mei Sheong Wong reviews the new exhibition ‘Collaborative Variations’ featuring various South Australian and interstate printmakers, artists and writers. 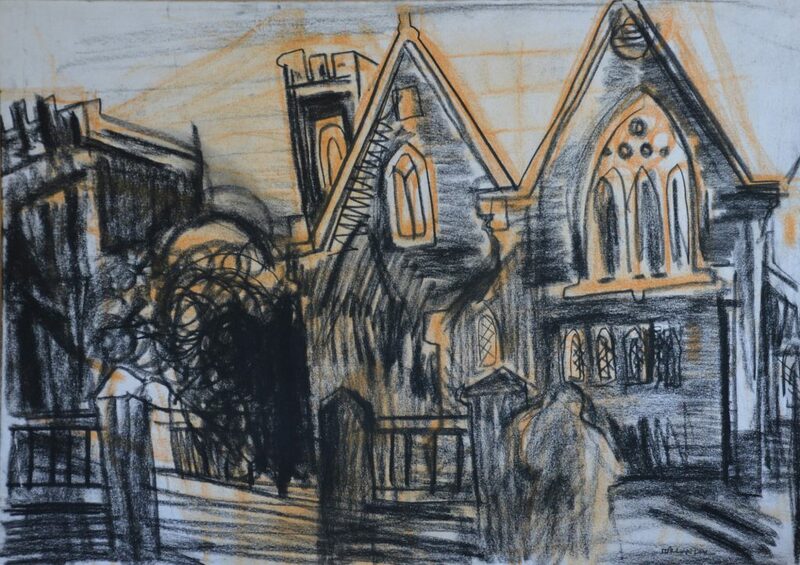 Curated by Simone Tippett, the exhibition explored the possibilities of collaborating. Adelaide artists paired with regional South Australian and interstate artists to make collaborative works, against the odds of distance, time constraints, travel and very busy lives. Collaborative Variations explored the nature and form of the relationships that grow from making work together (often despite great distances), with the results evidencing the integrity, intimacy and friendship of each unique collaboration, and each pair of artists finding new ways to make work, despite all odds. This lovely exhibition shows that collaborations can be many and varied… an inspiration. 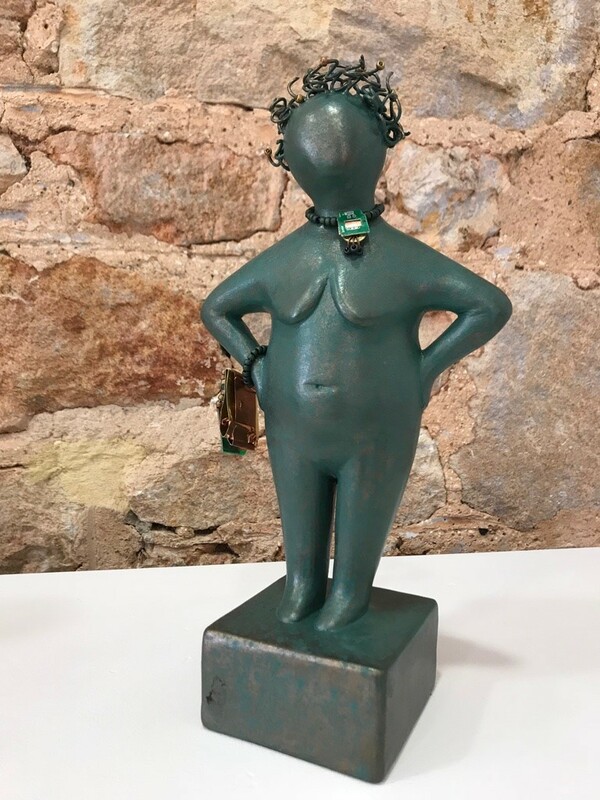 Artist pairings: Tracy Crisp & Caren Florance; Simone Tippett & Shags; Vicki Reynolds & Ian Tully; Sonya Hender & Simone Lyon; Sandra Starkey Simon & Joy-Anne Poppy, Lloma Mackenzie & Heather Shimmen; Christobel Kelly & Lorelei Medcalf; James Parker & Helen Carter; Deborah Miller & Reg Moore. 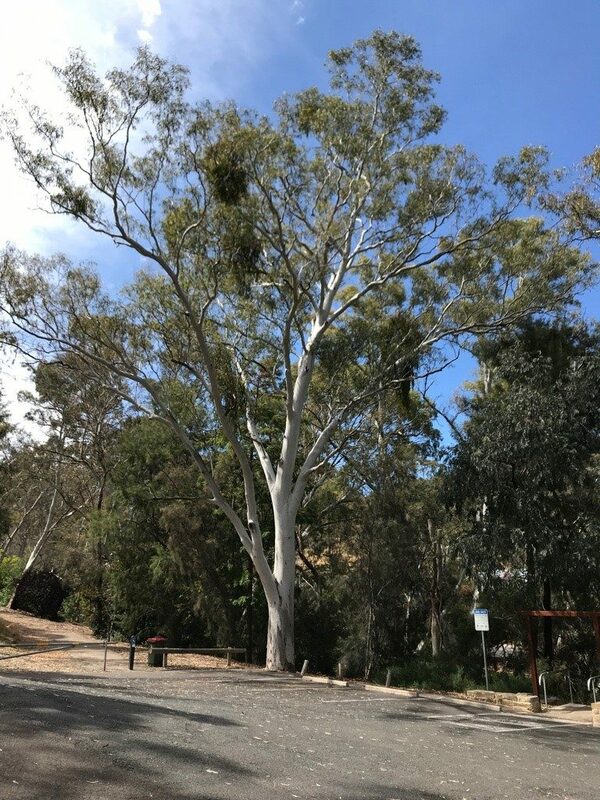 It is apparent, fellow space-travellers, that Gallery 1855’s parking lot is ideal for landing spacecraft – within verdant bushland, on the fringe of Adelaide Geosyncline’s metropolis. 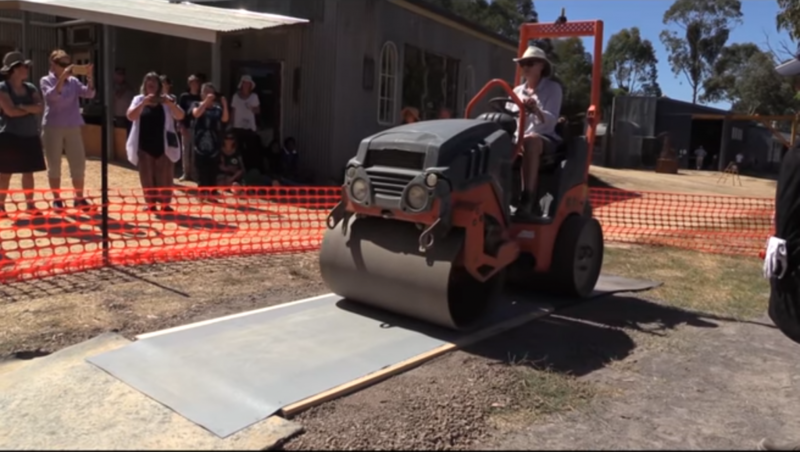 The renovated stone building was accessible for smaller craft with wheels. Its interior consisted of several display areas, a community studio/meeting room, kitchenette, toilet facilities, and a wrap-around ramp to a lower level. The first room was devoted to Animal Brides – a bevy of skilfully executed monotypes. Unsettling hybrid entities emerged, like those from ominous bedtime stories. Tonal images and austere text were fashioned with alacrity by Christobel Kelly and Lorelei Medcalf, latter-day aficionados of fable and folklore. Digital reproductions of their original prints have been collated into hand-sewn, limited-edition artist books. Planetary collectables, certes. The second room held work by three pairs of artist-collaborators. 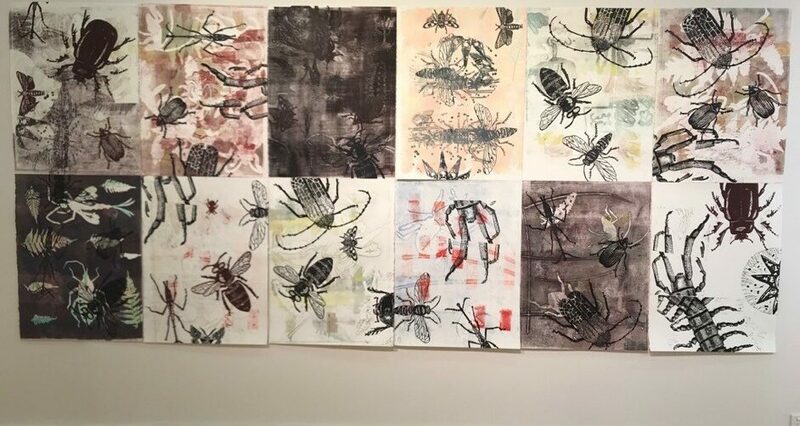 An elaborate suite of twelve relief monoprints, by Lloma Mackenzie and Heather Shimmen, celebrated Predators & Pollinators. Subtly tinted layers, with upscaled linocut insects in dynamic compositions, lauded these curious critters’ significant biological roles, within complex, global ecosystems. The next pair of Earthlings, Caren Florance and Tracy Crisp, turned away from the animal world, to evoke the wrenching, human experience of grief. A poignantly vacant wooden chair adjoined starkly majuscule text on sheer fabric. A sequence of brief phrases conveyed the raw despair of personal loss. This expression of anguish was muted by a bleak fall of dark felt… It’s curtains. Creative cousins, Joy-Anne Poppy and Sandra Starkey Simon, together developed Untitled. This beguilingly unpretentious textile artefact of rustic material was daintily screen-printed and delicately embroidered. Their quiescent process manifested an unspoken exchange system of lifelong trust and understanding. 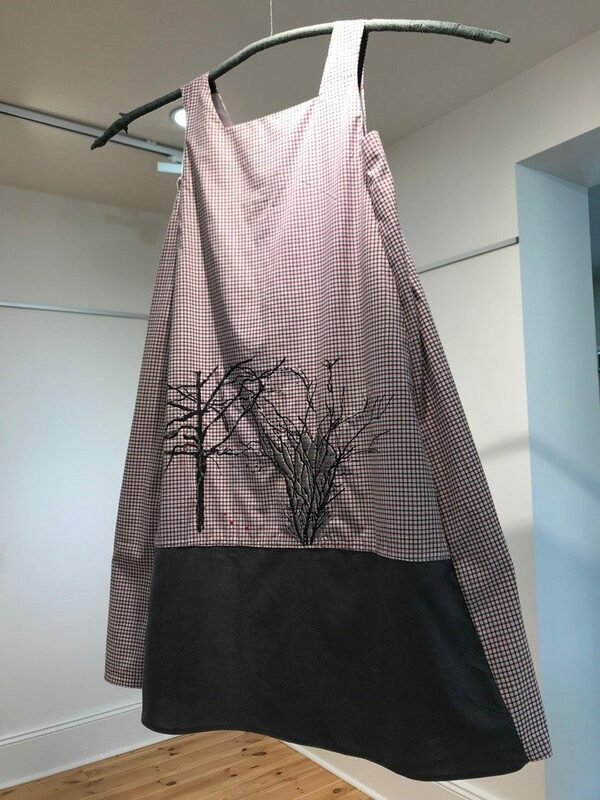 Imbued with intent, suspended like Strange Fruit, this eerily disembodied garment gently hovered and rotated in space, searching for its scarecrow. Doughty duo Simone Lyon and Sonya Hender arraigned solemn concepts of disempowerment, dominance and display, within an ambivalent discussion about information-technology, self-esteem and inequity. Their intellectual maelstrom culminated in the creation of four pert ceramic figurines, boldly displayed in the atrium. These Martian-green characters were whimsically adorned with rather “now” relics, from the ‘micro’ realm of electronics. Unique, collectable souvenirs have emerged from their evolving digital universe – and irresistible conversation pieces, vis à vis the indomitable impact of info-tech. 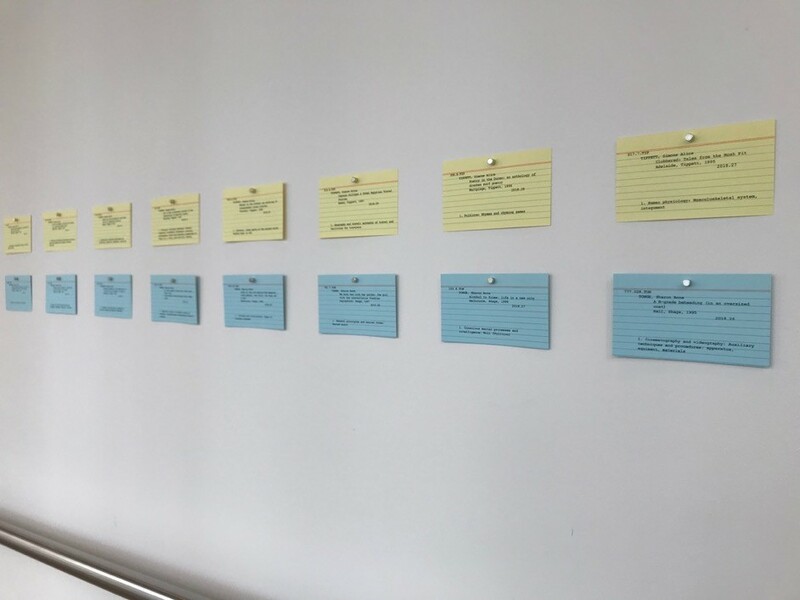 The walkway ramp was lined with two long, horizontal rows of archaic, library-catalogue index cards – Dewey Decimal System, for the initiated. The blue and yellow cards originated from San Francisco’s funky town, way across the Pacific – colour-coded to match each artist’s Teutonic VW Kombi-van: Simone Tippett (yellow) and Shags (blue). These seemingly innocuous prints evinced the quaint appeal of last century’s typewriters. Perusal of each series of ‘self-portrait’ cards required gradual perambulation. Carefully-worded phrases were formatted as book titles on the cards, with artist labelled as author. 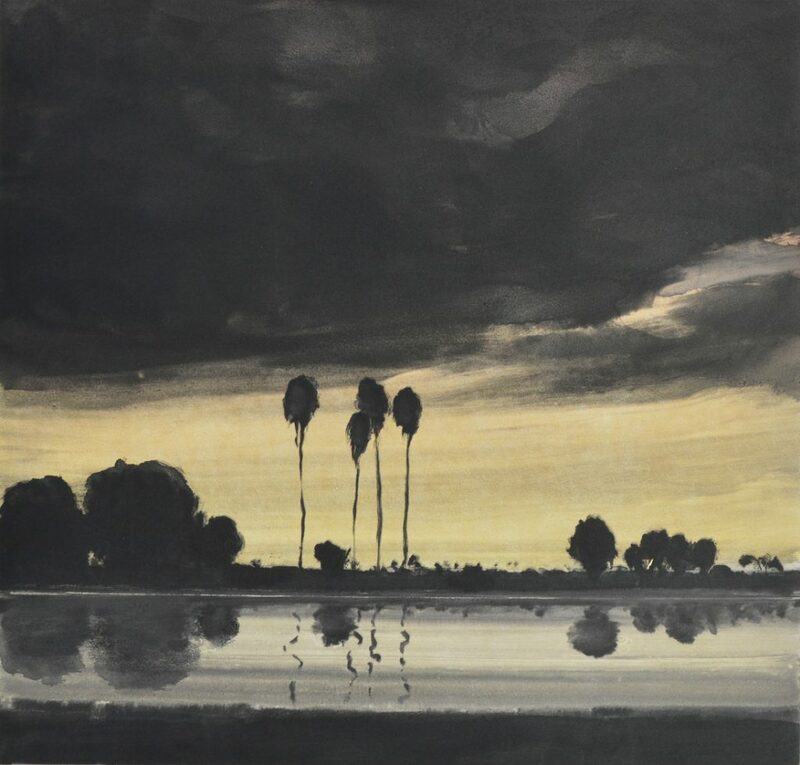 The parallel series evoked a range of intimate experiences – light-hearted, banal, achingly upsetting, searingly traumatic, calmly reflective, etc – from various stages of personal development, in each artist’s life journey. Time taken, apprehending the conceptual, emotive and haptic balance of this work, was well and truly rewarded. Further along the walkway, Deborah Miller and Reg Moore collaborated on a series of prints to celebrate their overlapping delight in swimming, gliding, acrobatic flight, landscape, nature, printmaking – and coffee. 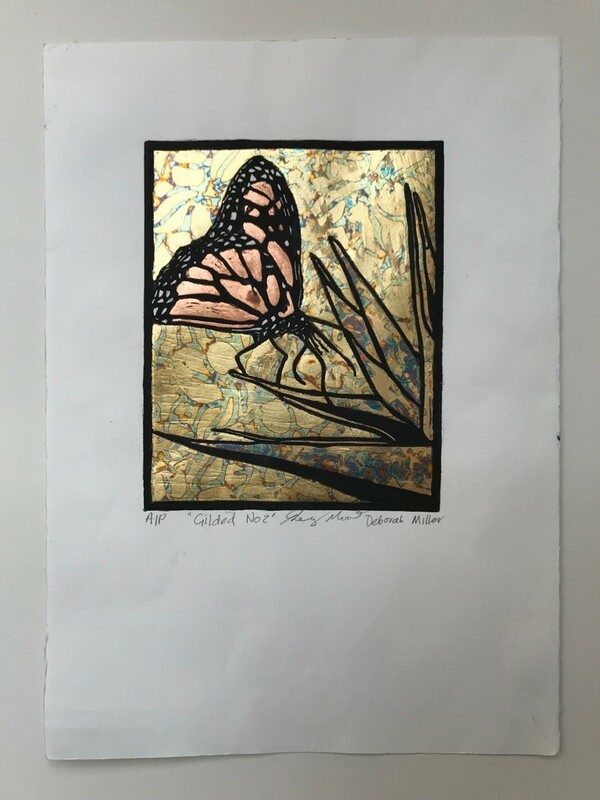 Metamorphosis of the Monarch Butterfly, symbiotically linked to the Bird of Paradise, symbolised the gradual development of an artist-printmaker. 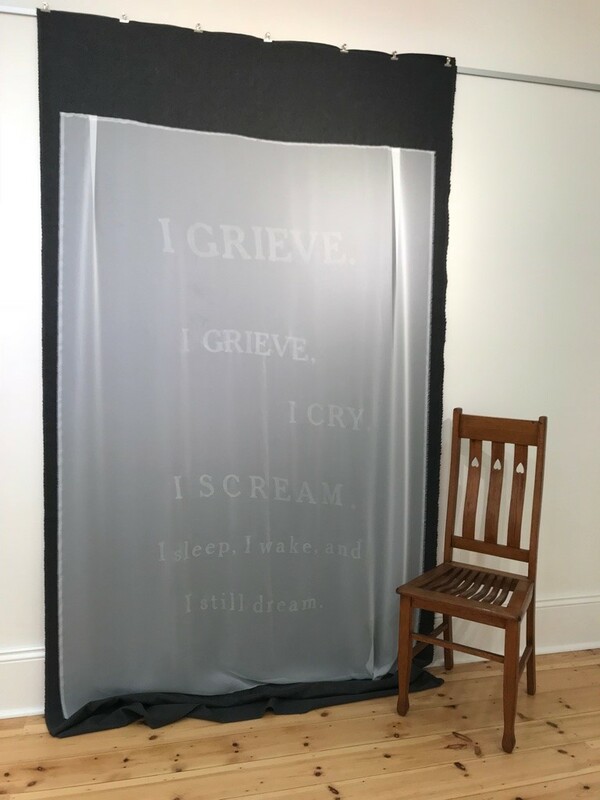 Shared concerns about food security and sustainability inspired a bold, Arte Povera installation by long-term collaborators, Vicki Reynolds and Ian Tully. 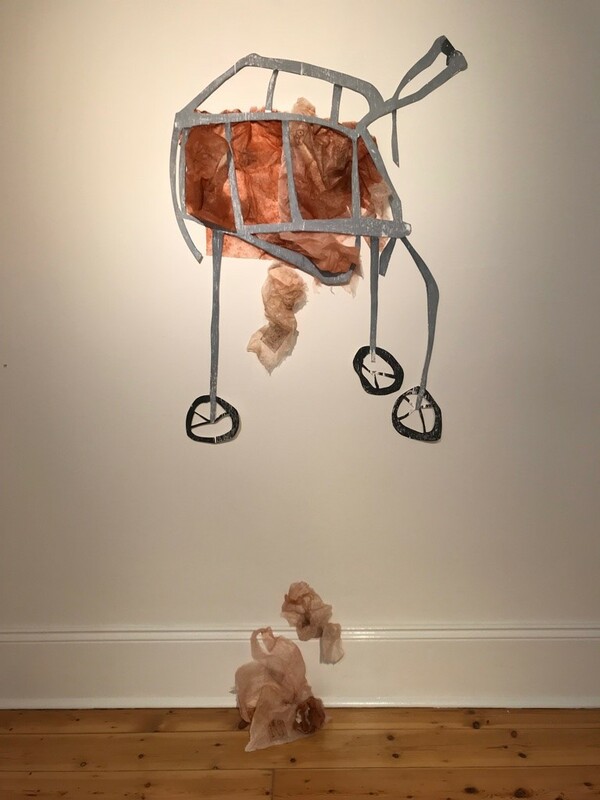 Crumpled Kozo paper lumps, like discarded food wrappers or packaging, tumbled through the gaps of an iconic, misshapen cart – an eloquent wall-drawing of printed paper traces. This bitter-sweet work, with its striking materiality of strips, scraps and stains, alluded to “borrowed” supermarket trolleys – those punctuating the bleak alleyways of blighted conurbations, stuffed with forlorn, hand-me-down belongings of our homeless wanderers. Despite the jaunty wheels, its contradictory stasis mirrored the unending trail of empty promises, the outmoded rhetoric of “trickle-down economics” – from ‘those’ wretched, neo-liberal non-leaders. 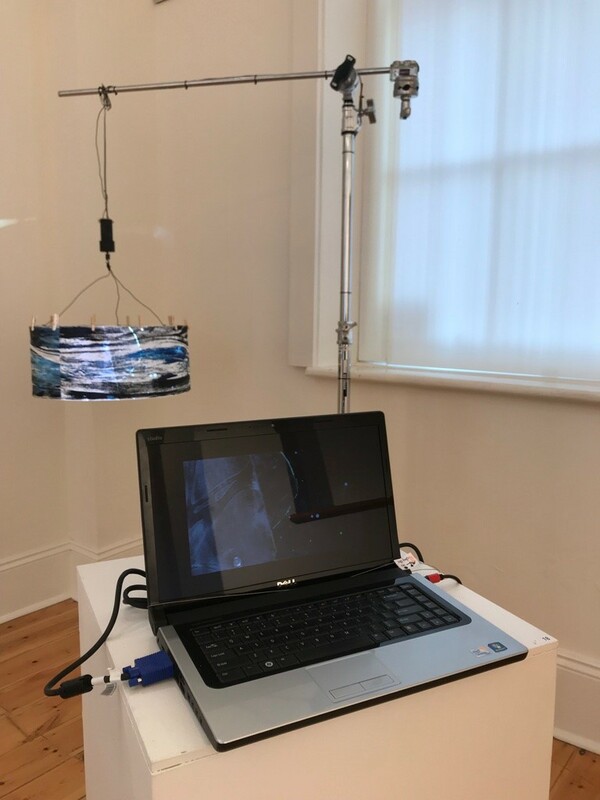 Last but not least, the Nightswimming collaborators, James Parker and Helen Carter, skipped across continents to develop a multi-part installation. This comprised a techno-spatial journey – from the playful physicality of outer-space/marine-inspired puppetry, through the vigorous abstraction of colourful streaks on vertical scrolls (weighted with ubiquitous bulldog clamps), to the soothing contemporaneity of moving images, nattily projected on a rotating lampshade. Rest assured, fellow space-travellers, this exhibition was clearly designed to lure us away from mundane disappointments and insoluble quandaries. Why fret about the meaning of life, when we could be diving, spinning, floating together – through a marvellous, midnight universe?